Ronda Henry-Tillman, M.D. (center), was named recipient of the Muriel Balsam Kohn Chair in Breast Surgical Oncology at a Nov. 29 ceremony. She is shown with UAMS College of Medicine Dean Pope Moseley, M.D., and UAMS Interim Chancellor Stephanie Gardner, Pharm.D., Ed.D. 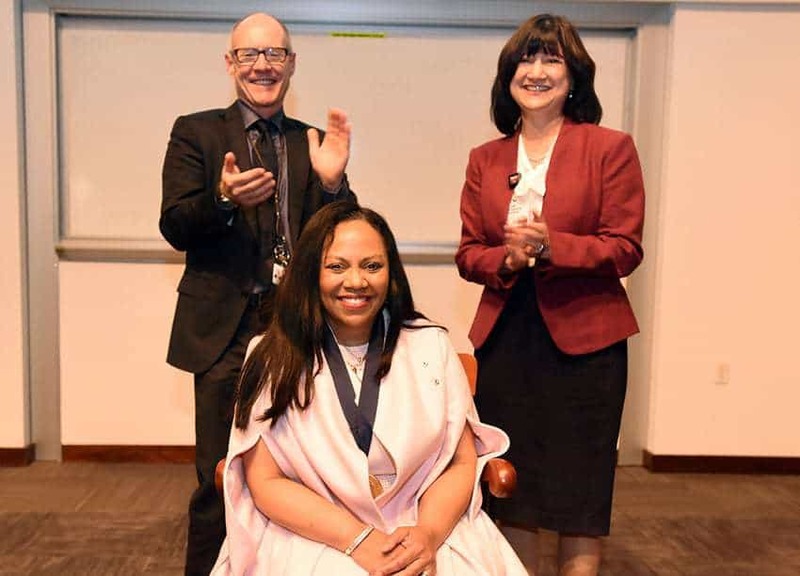 Nov. 30, 2017 | Nov. 30, 2017 – Ronda Henry-Tillman, M.D., F.A.C.S., was invested Nov. 29 as recipient of the Muriel Balsam Kohn Chair in Breast Surgical Oncology at the University of Arkansas for Medical Sciences (UAMS). She is chief of Breast Oncology in the UAMS College of Medicine Department of Surgery. The endowed chair is the result of a gift from the Tenenbaum Foundation. The foundation’s primary objectives include providing humanitarian assistance to residents of central Arkansas, promoting awareness of breast cancer, and funding research to reduce or eliminate deaths from the disease. NBA Hall of Famer and philanthropist Dikembe Mutombo praised Henry-Tillman’s efforts at educating health care providers in Africa. The chair is named in honor of Muriel Balsam Kohn, mother of Judy Tenenbaum, who died of breast cancer in 1993. “I am thankful for the generosity and foresight of the Tenenbaum Foundation in establishing this endowed chair, which has enabled valuable breast cancer research to be conducted in Arkansas for the past 10 years. 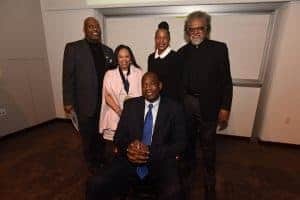 This legacy will continue for many years to come through the work and dedication of Dr. Henry-Tillman,” said UAMS Interim Chancellor Stephanie Gardner, Pharm.D., Ed.D., who also serves as senior vice chancellor for academic affairs and provost. An endowed chair is among the highest academic honors a university can bestow on a faculty member and is established with gifts of $1 million, which are invested and the proceeds used to support the educational, research and clinical activities of the chair holder. Those named to a chair are among the most highly regarded scientists, physicians and professors in their fields of expertise. “Dr. Henry-Tillman has been a valuable member of the UAMS faculty since 1998, not only serving as a knowledgeable and caring physician for countless women, but also as a tireless advocate for underserved Arkansans who lack basic health care services. 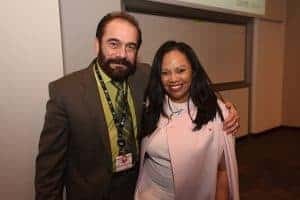 There is no doubt that her work to improve access to mammography services has extended the lives of women across our state,” said UAMS Cancer Institute Director Peter Emanuel, M.D., who also serves as professor of medicine in the UAMS College of Medicine. 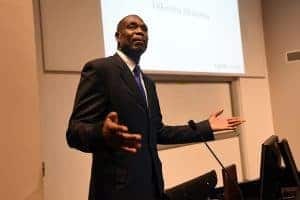 NBA Hall of Famer and philanthropist Dikembe Mutombo addressed the attendees gathered to honor Henry-Tillman at a Nov. 29 ceremony, praising her work at educating health providers in Africa, including at the Biamba Marie Mutombo Hospital he founded 10 years ago in the Democratic Republic of the Congo. 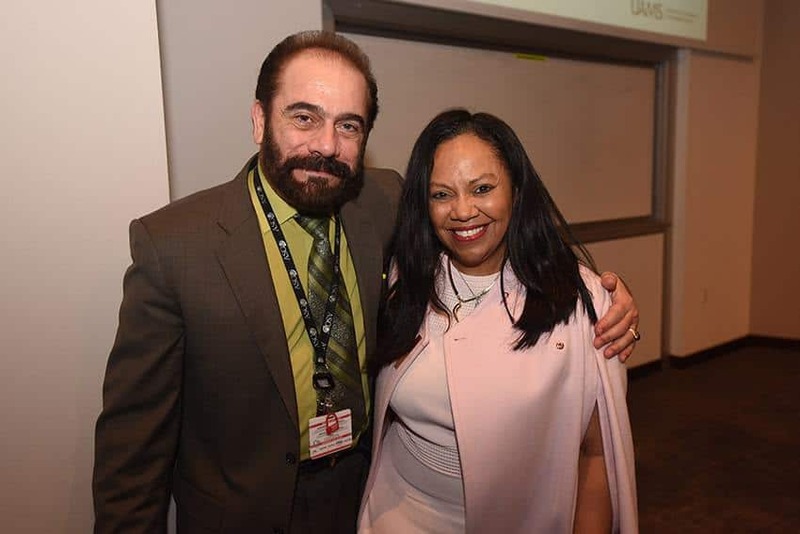 Ronda Henry-Tillman, M.D., is congratulated following her investiture ceremony by Issam Makhoul, M.D., director of the UAMS Division of Medical Oncology. Henry-Tillman’s mentor, Groesbeck P. Parham, M.D., recruited her to travel to Africa where she has taught breast surgical techniques and medical procedures to health care providers who have limited access to equipment and advanced educational opportunities. Parham is a professor of obstetrics and gynecology at the University of North Carolina, Chapel Hill. After earning her medical degree at the University of California San Diego School of Medicine, Henry-Tillman completed her surgical residency in the UAMS Department of Surgery and fellowship training in the UAMS Fellowship in Diseases of the Breast program. She holds the positions of professor in the Department of Surgery, co-director of Health Initiatives and Disparities Research in the UAMS College of Medicine, and co-leader of the Breast Tumor Disease Oriented Committee in the UAMS Winthrop P. Rockefeller Cancer Institute. She previously served as director of the UAMS Cancer Control program and was instrumental in the development of the university’s mobile mammography program. Her research efforts have focused primarily on health initiatives that address access, community-based participatory research, health disparities and health policy in the areas of breast, prostate, colorectal, and cervical cancer prevention. Joining Ronda Henry-Tillman, M.D., (second from left) at the ceremony in her honor were (from left) her husband, Robert Tillman; Dikembe Mutombo; Rose Mutombo; and Groesbeck P. Parham, M.D. In 2016, Henry-Tillman was appointed by Gov. Asa Hutchinson to the Arkansas Medical Marijuana Commission and was voted chairman in 2017. She also is a member of the Breast Cancer Control Advisory Board and is a Pulaski County health officer for the Arkansas State Board of Health. Her memberships and professional activities include the American Surgical Association, Society of Surgical Oncology, Southern Surgical Association, Society of Black Academic Surgeons, National Medical Association, American Society of Breast Surgeons and multiple committees of the National Institutes of Health. She has served as a board member for the National Accreditation Program for Breast Centers and the national Health Disparities Committee for the American Cancer Society, as well as the Arkansas Cancer Coalition and other local organizations. She has received numerous awards and honors including being named to the Alpha Omega Alpha Honorary Medical Society, Best Doctors in America and Castle Connolly’s Exceptional Women in Medicine. She is recipient of the Shipley Award by the Southern Surgical Association; the Rosetta Wilkins Award by BreastCare; the President’s Award by the Arkansas Medical and Dental Pharmaceutical Association; the President’s Award by the Arkansas Democratic Black Caucus. She also has received the Phenomenal Woman in Science and Excellence in STEM Mentoring awards. The Tenenbaum Foundation was created in 1964 by Joe M. Tenenbaum. The foundation created the chair’s endowment in 2007 to recognize Kohn and the chair’s first holder V. Suzanne Klimberg, M.D., Ph.D., former director of the UAMS Division of Breast and Surgical Oncology. Klimberg now serves as medical director of the University of Texas Medical Branch Cancer Center in Galveston, Texas.